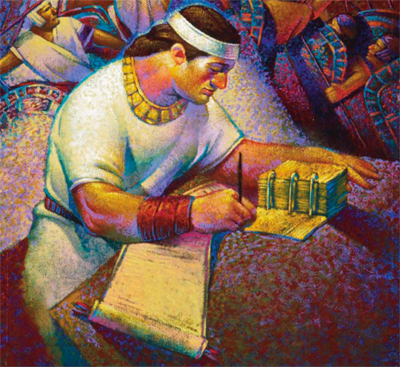 In a groundbreaking study on the structural outline of Nephi’s first book, Noel B. Reynolds proposed that this division takes place between chapters 9 and 10 of 1 Nephi.1 One reason for this is that Nephi’s language at the beginning of chapter 10 seems to indicate that the promised narrative shift would occur here: “And now I, Nephi, proceed to give an account upon these plates of my proceedings, and my reign and ministry” (v. 1). Wherefore, ye need not suppose that I and my father are the only ones that have testified, and also taught them. Wherefore, if ye shall be obedient to the commandments, and endure to the end, ye shall be saved at the last day. And thus it is. Amen. Chart from Noel Reynolds's article "Nephi's Outline"
In contrast, the second unit (chapters 10–22) quickly transitions into Nephi’s expanded vision of the Tree of Life (1 Nephi 11–15), and it ends with Nephi’s prophecies about the restoration of Israel in the last days. In this unit’s deliverance episodes, Nephi began to fulfill his role as Lehi’s prophetic successor.4 Instead of Lehi taking the lead, it was Nephi who spoke unto Laman and Lemuel while being “filled with the power” (1 Nephi 17:48), and who “did shake them, even according to the word which he had spoken” (v. 54; emphasis added). It was Nephi who received the commandment to build a ship (vv. 7–8). And it was Nephi who encouraged Lehi to remain faithful after Lehi himself murmured against the Lord (1 Nephi 16:20–25). 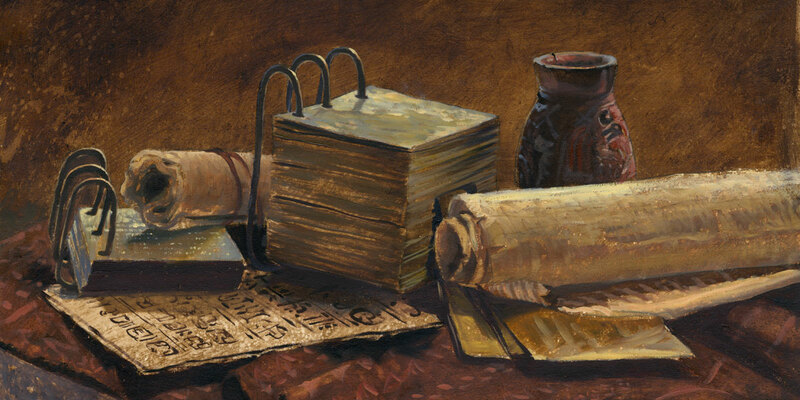 Because Nephi did not directly explain the structure of his writings, it is impossible to know with certainty where his summary of his father’s record ended and the account of his own proceedings began.5 Yet a break between 1 Nephi 9–10 is especially inviting. It nicely explains (1) the unique formal conclusions to chapters 9 and 22, (2) Nephi’s emphasis on his own “reign and ministry” in 1 Nephi 10:1, (3) why Lehi’s prophecies and leadership role is emphasized in chapters 1–9 and then Nephi’s prophecies and leadership role is emphasized in chapters 10–22, and (4) the many structural parallels between the two proposed units. 1. See Noel B. Reynolds, “Nephi’s Outline,” in Book of Mormon Authorship: New Light on Ancient Origins, ed. Noel B. Reynolds (Provo, UT: Religious Studies Center, Brigham Young University, 1982), 53–74. 2. See Reynolds, “Nephi’s Outline,” 56–57. S. Kent Brown has similarly proposed that 1 Nephi 1–10 make up Nephi’s summary of his father’s record. See S. Kent Brown, “Nephi’s Use of Lehi’s Record,” in Rediscovering the Book of Mormon: Insights You May Have Missed Before (Provo, UT: FARMS, 1991), 6. 3. This chart is derived from Reynolds, “Nephi’s Outline,” 58. 4. See Noel B. Reynolds, “The Political Dimension in Nephi’s Small Plates,” BYU Studies Quarterly 27, no. 4 (1987): 14. 6. The concept of mutually sustaining prophetic witnesses also plays an important role in the chiastic structure of 2 Nephi. See Noel B. Reynolds, “Chiastic Structuring of Large Texts: Second Nephi as a Case Study” in To Seek the Law of the Lord: Essays in Honor of John W. Welch, ed. Paul Y. Hoskisson and Daniel C. Peterson (Orem UT: The Interpreter Foundation, 2017), 340–341. See also, Bruce A. Van Orden, “The Law of Witnesses in 2 Nephi,” in Second Nephi, The Doctrinal Structure, Book of Mormon Symposium Series, Volume 3, ed. Monte S. Nyman and Charles D. Tate Jr. (Provo, UT: Religious Studies Center, Brigham Young University, 1989), 307–321. 7. See John W. Welch and J. Gregory Welch, Charting the Book of Mormon: Visual Aids for Personal Study and Teaching (Provo, UT: FARMS, 1999), chart 92. 9. See Noel B. Reynolds, “Nephi’s Political Testament,” in Rediscovering the Book of Mormon: Insights You May have Missed Before, ed. John L. Sorenson and Melvin J. Thorne (Salt Lake City and Provo, UT: Deseret Book and FARMS, 1991), 220–229.